TheRiver is a free HTML5 Bootstrap 4 hotel resort website template. Sticky top navigation bar, call to action buttons, parallax effect, testimonials, pricing tables are also in the box. There is a blog archive section and single blog page is there to share your business ideas. A contact form and newsletter subscription form with HTML5 validation come with the package too! 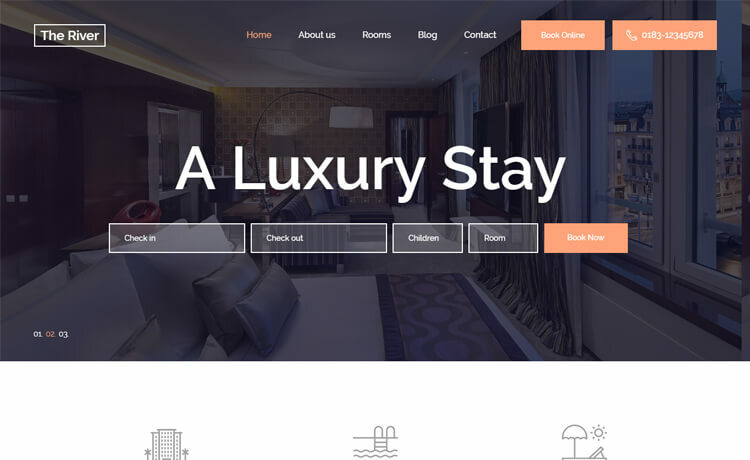 TheRiver is one of the beautiful free HTML5 templates for hotel resort or accommodation business. It is a multi-page responsive theme built with the latest Bootstrap 4 framework. Moreover, TheRiver comes with tons of trendy and tech-savvy features. Hero slider with an advanced booking widget on the header is one of the stylish features bundled with it. Furthermore, Sticky top navigation bar, call to action buttons, parallax effect, testimonials, pricing tables are also in the box. There is a blog archive section and single blog page is there to share your business ideas. A contact form and newsletter subscription form with HTML5 validation come with the package too! Create a stunning hotel resort website with TheRiver with a minimum effort and time! Thank you for downloading TheRiver.